Does your children's room ever look like a bomb went off in it? Oh, that's only me? Well, that's okay. Since we're being honest here, our girls room looks like this probably 5 days a week. No joke. Our two year old likes to try on 1897356198579578 outfits a day, so she literally yanks every item of clothing out of the dresser; puts on every.single.dress up costume they own, and then discards it on the floor. Yeah, you get the idea. Add toys, Disney dolls and jewelry to the mix....it makes for a disaster area. So yesterday, I decided to conquer the room. I filled up a gigantic rubbermaid with toys that they don't play with, and put it in the trunk for the goodwill. 4 bags of clothes also joined the toys in the trunk. Once the room was deep cleaned and looking excellent, I still had the issue of not having anywhere to store their bigger dolls. If you remember, I already built something to store their stuffed animals, but I was at a loss on WHERE to store these dolls that would still be accessible to them. So off to Pinterest, but no luck. All I saw was the American Girl doll storage, and that was just for one--I needed storage for more than that! So I sat. And looked around their room. And kept thinking. Then I spotted the dead space under our 3 year old's toddler bed, and had the light bulb moment! I can build a custom drawer type storage to fit them all under there! WOOOHOOO! I measured, looked around the garage and decided I could use material I had on hand. I took 1x4s and cut them down to 1x2.5 inches instead, so that with an inch gap between my two frames the total height would be 6 inches. I built the first box according to my measurements I took under the toddler bed. Then I built the second one. I attached them with some scraps that came off my cut 1x4s--4 of them, one in each corner. Then I realized that the current mdf sheet I had in the garage wouldn't work! So I ended up cruising to Home Depot to pick up two drawer pulls and a 1/8" thick sheet of MDF-my total being $9.11. 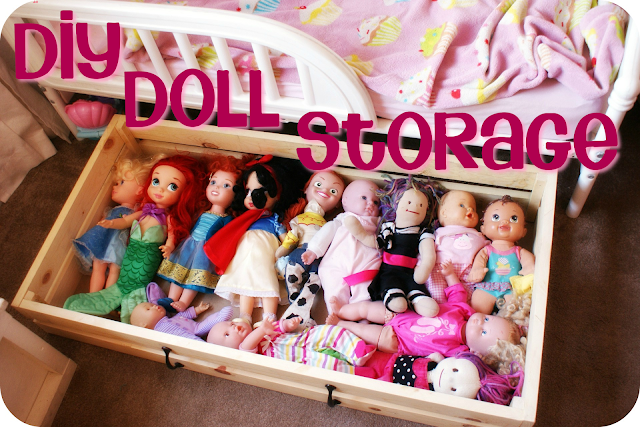 I came home and attached my bottom and drawer pulls, and I had a super cool Doll Storage! I am tickled with the finished product, and so proud of myself for coming up with an awesome, CHEAP design--all on my own! Which is a huge accomplishment, because, well, organizing thoughts in this head is a near impossible feat! Hope this project inspires YOU to do AMAZING things! What a super cute idea and execution!! I'll have to put this in my project archive!! You have a very fun blog! Lime Green To The Rescue! Oh Disneyland, how we love thee!